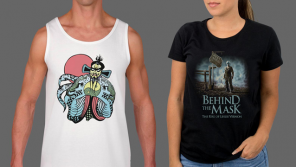 The Plastic Fang collection is a place within Fright-Rags that allows their team to create t-shirts that do not fit the horror genre specifically. When was the last time you saw a really cool, original shirt for Little Monsters, The Wizard or The Running Man? I don’t know about you, but I loved these as a kid and I know many of you would gladly rock a t-shirt designed by Abrar Ajmal or Kyle Crawford. Live out our childhood each day with the Plastic Fang collection. T-shirts from Little Monsters, The Wizard and The Running Man are on sale now at Fright-Rags.com; in stock and ready to ship.